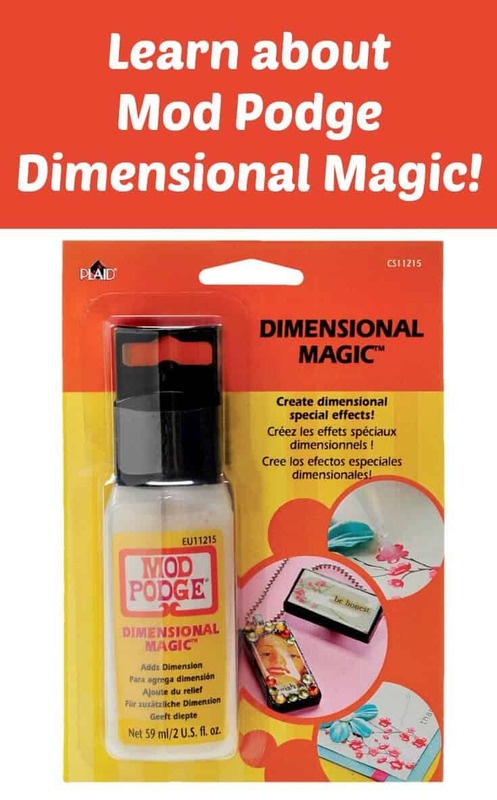 What is Mod Podge Dimensional Magic? This acrylic epoxy-like product is great for making jewelry, gifts and more. Learn more about it here! Scroll down to the bottom of the post to get a video all about this fantastic product. You'll get to see it in action as well. I've been getting a lot of questions about this product, so I thought I would utilize a blog entry to give you all of the information. Even if you don't think you need to know about this amazing product, I promise you – you do. Dimensional Magic is just plain wonderful. Like everything Mod Podge. 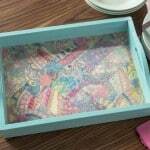 What is Mod Podge Dimensional Magic? First of all, it's a waterbased product, and it's non-toxic. Secondly, it creates an epoxy-like finish on a project surface. 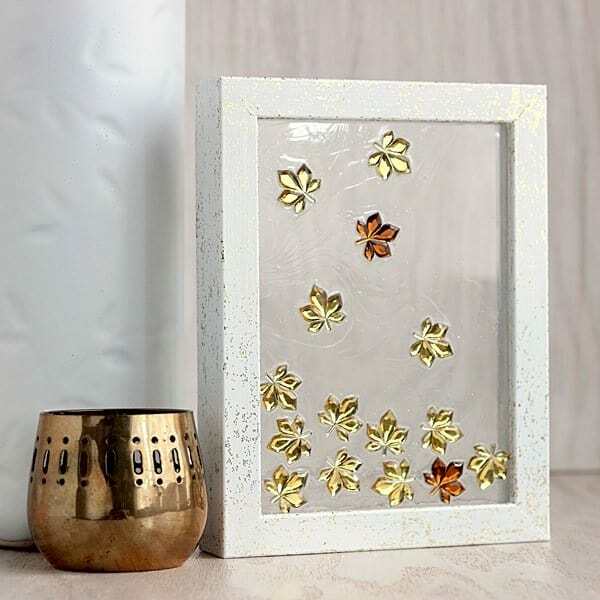 You can see it in the sample projects or video at the bottom of this post; it's glassy and three-dimensional, and it adds interest to the surface of your project. Think Envirotex on a much smaller, less-toxic scale. It goes on cloudy but dries completely clear. What projects do you recommend it for? Anything really, but it works very well on jewelry, accessories and cards. 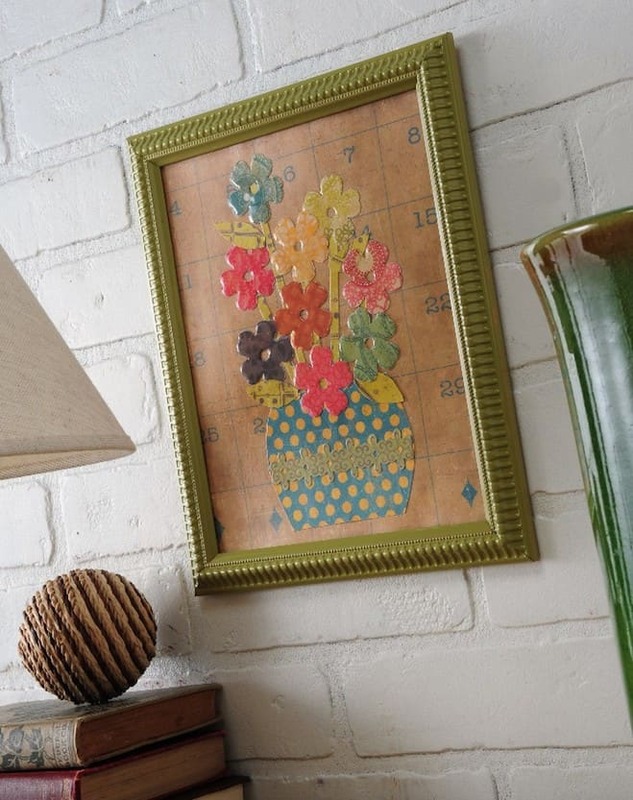 Your best bet is to use it to accent small areas. It looks very sharp on bracelets, rings, brooches, belt buckles, necklaces, etc. I also like it on handmade cards. I'm a big fan of Mod Podging stuff down and then using Dimensional Magic on top of my decoupaged surface. What surfaces can I use it on? Just about anything – wood, tin, glass, plastic/acrylic, paper . . . it will dry crystal clear on all of them. 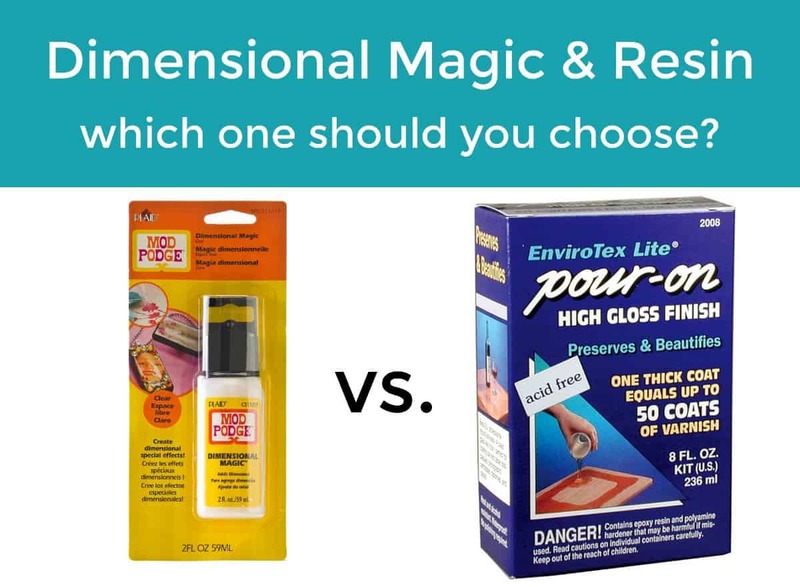 What is the difference between Mod Podge Dimensional Magic and resin? DM is a waterbase, acrylic product as I said before. This means that you can get it on your fingers and wash it off – and it's not going to hurt you. You don't need to wear a mask or gloves to apply it and the fumes aren't toxic. There's also no mixing required – the formula can be applied as-is. Dimensional Magic is used for small projects. You wouldn't use it to cover a table. Resin is a “reactive polymer compound” and typically a two part process. For example, the most common resin (that I have used before) is Envirotex Lite. It's MUCH thicker than Dimensional Magic, and creates a much thicker finish (the box says one coat is equivalent to 50 coats of varnish). I'm not an expert in reactive polymer compounds, but I can tell you this stuff is toxic. Not that you shouldn't use it, but you have to wear gloves when you do. You mix two parts together, apply immediately, and then it hardens into a VERY thick coat. Resin is waterproof, heatproof, and hard to mark. It's perfectly appropriate for larger projects such as countertops, tables, large trays, etc. For more reading, I wrote an entire guide all about the differences (and when you use each) here. Do you have any tips for usage? Why yes! Thank you for asking. Sometimes when DM dries, because it's waterbase, there's a dip in the middle. When that happens, just layer it! Yes, you can layer it on top of itself and it dries crystal clear. I also have a second tip. If you decoupage below your Dimensional Magic, make sure the surface is completely dry for several hours before applying the DM. If there is moisture below the DM, it can get cloudy when dry. Where can I buy it? This is probably the question I've been asked most often. You can get it online at Amazon, and it's also sold at most craft stores including Jo-Ann, Hobby Lobby, A.C. Moore and Michaels. I hope this helps. Complete instructions for usage are on the back of the package, and I'm telling you that it's just about as easy as Mod Podging. I'm off to DM a fake eyeball! Or something. . . I was wondering if the Dimensional Magic would work on Scrabble tile projects. I have a hard time finding the diamond glaze and this looks like you get the same effect. Thanks! I’ve been stalking my local JoAnn’s and Michaels but haven’t seen it yet. I ordered another “jeweler grade” resin to try based on input from someone I met at a art fair but I love MP products so I’m really anxious to play w/ this! dm makes my heart sing!!! Yea for DM!!! One of my fav products!! Thanks for links to where to find it. They do not have it here in the UK and I thought I was going to have to wait til I went back home to the US to buy this .. I am going to try this on my projects currently I have been using Glossy Accents .. Thank you Amy! I’ve had those very same questions. It’s like you have ESP. I’ll check my JoAnns…and then if it’s not there, I’ll go the online route! You rule! Thanks for this – it looks like really useful stuff! what a co-wink-a-dinky i bought some this week – didnt know what i was going to use it on but had to have it. cant wait to try it out. Thanks to all for the comments! Robin, it works GREAT on Scrabble tile pendants. Try it and you’ll love it! Wow, I am livin in the boonies. Thanks for keeping me updated of what goes on out there. I love this product already! Can’t wait to try this out — thanks!!! That looks like a wonderful product. Thank you for explaining it further to us. Bought this online about a month ago and forgot I had it!!!!! I’ll give it a try this weekend with a couple of Christmas projects I have lined up (yes, already!). So glad to hear it works on pendants! I hate using the stinky toxic stuff just for the pretty shine. What am I doing wrong every time I use this product I get small tiny bubbles all over my project? I followed the instructions on the bottle and still no luck. 🙁 HELP!! Made some pendents with this. I printed pictures from my ink jet mod podged them into the pendents (using matte mod podge). Then used dimesional magic to fill in (two coats to get the bubbled effect). Went on cloudy, but dried crystal clear. But about 1 week later clouded up again, looks kind of milky now. Any ideas what went wrong? Maybe the ink from my printer? Any help would be appeciated! Thanks! Anonymous – if you have that many little bubbles in your project, I would buy a new bottle. It may have been shaken too much, either on the shelf or in transit. That many bubbles is not normal, and tells me that someone shook the bottle at some point. Time for an exchange! Wendy – I definitely think it’s the inkjet printer. All inkjet prints need to be sealed with a clear acrylic sealer before decoupaging or any kind. If you did that, then it would have to be a weather thing (hot, humidity). Hope this helps! The bubbles are normal! Just use a toothpick or fingernail and pop them out. It works perfectly. Hi there, just wondering if you know about using DM on polymer buttons for knitted garments- would I be able to throw it in the washer and dryer without making a mess? Thank you. Hi! Unfortunately you can’t wash DM – it’s waterbased so it will dissolve. You could use it on removable button covers, but that’s it. Thanks for checking! I made a dome ring for the first time and 5 days later, it will still dent with my fingernail. The dent will revert and fill back in a few minutes later. I thought this was supposed to dry resin/plastic/glass hard. It’s a deep bezel, did I need to apply in several thinner layer? I filled all the way, then it sunk, and I had to fill two more times and finally got the dome. Am I doing something wrong or is this stuff supposed to dry a little pliable? I’m afraid to wear it because if it bumps something, it’ll probably be ruined. Hi Sherriel! DM dries VERY solid, so the fact that you can dent it doesn’t sound right. It does sink, and yes you can reapply, but it should dry glass hard and you should not be able to dent it. I don’t think you are doing anything wrong – I would exchange what you have. Thank you so much for this post! I have been wanting to use DM for some Christmas presents on some pendents. I am really excited about it, just didn’t really know if it was worth it or if I had to use the scary toxic stuff. Lol Toxic+Toddlers= DANGER! Thank you! I used this to create a pendant w/ a photo. The photo used was cut from a Kodak print, then Mod Podged onto the pendant. I let it dry then added the DM. It dried clear, but now it looks like the picture has been “crackled”. Maybe I didn’t let the Mod Podge dry long enough? Could it be that I used a photo print? Thanks so much! Unfortunately the cracking happens sometimes in certain temperatures. For more successful results next time, dry the DM in a *warm* oven. Turn to 350, cool WAY down til it’s just warm (not hot at all or it will crack) – then place the item on a cookie sheet. That should help. Don’t ever dry near a cold window. I haven’t looked in store but Hobby Lobby has it available online. I’m going to look in store tomorrow because I’ve been wanting to try this with soda bottle caps. Going to make necklaces for my daughter and nieces! I’m having issues with cloudiness (re: Wendy, August 25, 2010). I’m not using a printer, I’m using paint. When the project is initially finished it looks excellent, but clouds up. And these results aren’t consistent. Some pieces remain clear and others don’t. Any ideas? Hi Mancia! Please send me an e-mail, modpodgerocks at gmail dot com – I would love to help! Please send pictures (even cell phone ones) if you can. 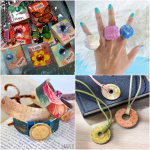 I agree with Sherriel, I’ve tried using MPDM to coat some pendants I want to sell and it definately does dent with a fingernail – I can’t sell a product in that condition. Also, what can I use to spread it around a bit so it doesn’t clump in one spot? Hi Jenn, how long did you allow the Dimensional Magic to dry before trying to dent it? In humid temps it takes longer. If you waited days, I would call Plaid (plaidonline.com). I have tons of DM pendants that I’ve made and none of them can be dented with a fingernail. Hmmm! As far as what you can use to spread the DM, a toothpick works great! I made a dozen bottle cap magnets with seed beads and buttons. I filled them with DM (not in layers, just all at once) and they dried hard and clear, but now they are all cloudy. Bummed! My basement does get a bit cold at night. Could it be change in temperature? Or just too much DM? I was totally hooked until the cloudiness happened. I can provide photos. Hi Karen! Did you Mod Podge before you added the DM? Or glue? Not letting another glue dry enough before adding DM can make it cloud. I am glad it works for you. For my project it got all blueish and cloudy after just a few days. Really annoying stuff and ruined some of my items that were meant for sale. Will not use it again. Hi Arihoma! Did you Mod Podge before you added the DM? Or glue? Not letting another glue dry enough before adding DM can make it cloud. The Mod Podge should dry at least 48 hours before putting the DM on top. I have made at least 4 pieces; only 1 looks clear & pretty. The others, several days after it’s hardened, has a hazy look to it, like it’s no longer clear, & the stuff isn’t as pretty. Like it’s started to have the milky look it has at 1st when it is still wet. Hi Beth! Did you Mod Podge before you added the DM? Or glue? Not letting another glue dry enough before adding DM can make it cloud. The Mod Podge should dry at least 48 hours before putting the DM on top. Oh Ok, I have not been letting the glue dry long enough. I use acrylic paint in some of my pieces, I guess that is doing the same thing. Thank you so much for the tip. I’ve only been wainting a few hours or 1 night. Thanks for the response, much appreciated. I wonder if anyone has actually tried to capitalize on the cracking/cloudy aspects to get a really interesting finish? I’ve been using it purposely trying to make it look old and weird and gotten some nice effects but I’d love to hear any tips. Hi Richelle! No, I haven’t heard that idea but I think that’s a good point! I have some Connemara marble pendants that I’ve Mod Podged shamrocks to (the shamrocks were pressed in a book for 8 years, so they are definitely dried). After waiting 24-36 hours, I applied DM and then waited another 24-36 hours to apply another coat because the first one didn’t ‘dome up’. They were fine for a few days, but now are clouding up. What can I do to reverse this? I collected the shamrocks from Ireland 8 years ago and can’t get anymore. Is there hope? Can I heat them? Please help! I’m not sure that you can save them at this point. There’s no reverse, to my knowledge. Thanks, Amy. I soaked the cloudiest one of them in hot soapy water and the DM came off, but I have 3 others that look ok-ish, as the cloudiness is under the shamrocks. They are ready for another layer to dome them up, but now that I see what a little water can do, I’d prefer to use a different resin that is waterproof. Do you know if I can put the next layer on with Ice Resin over the DM? I’m wondering if they are compatible. So…i read the question regarding using dm on photos and you didn’t seem to say no you shouldnt…my project is about 3″x3″. Larger than a pendant but i definitely dont have even 24 hrs… the pkg says 3-4 hrs i thought….so is it worth using at all without 48 hrs? Can i use a blow dryer? Thanks!! Hi Katie! You can use it on photos, but if they are inkjet printed you’ll need to seal them first. And as far as drying time, because of the various climates people are in I always recommend letting things dry longer than the package says. If you are in a dry climate 3 – 4 hours might be enough! You can use a blow dryer but you have to be pretty far back! So this question probably has been answered a dozen times already but I want to absolutely sure that I understand the steps and the materials i need. I use an inkjet printer and glossy photo paper for my one inch bottle cap images for bottle cap jewelry. What would i need to use on them before applying dimensional magic to them? What types of options for a sealer are available that are non toxic? I can’t take the fumes of acrylic coating so I want to avoid if possible. Any suggestions? Also if I choose to use the epoxy stickers on them, would I still have to seal them first?? Hi there! You’d need to seal both sides of the paper with a spray acrylic sealer, then MP both sides, THEN Dimensional Magic. I personally find it easier to just get laser printouts made for DM’ing, because then you can avoid all those steps. I’m not sure I understand the epoxy stickers question! What do you mean by “MP both sides” ? I’m using Mod Podge to varnish polymer clay charms, I want to use it to fill tiny glass bottles. I made some bottle caps recently and want advice on the technique and materials i used for them to see if i can improve in any areas etc. First I took some cardstock in one inch circles, my bottle caps, and some super glue. (i have tried so many different glues but super glue has so far worked the best, any other suggestions?) Once the glued sets and dries, I took a sticker or added an embellishment to the cap. i couldn’t use the epoxy on it because of the raised 3D look i was trying to create, so I used the dimensional magic. When it completely dried, there were some crevices and craters that were not covered with dimensional magic. Any help would be appreciated. Is it possible to save the piece with an additional layer of dimensional magic? Hi there! It’s hard to visualize this, but it sounds like you didn’t use enough DImensional Magic. Yes, you can layer Dimensional Magic, so I’d try again! Good luck! Also how long before I can apply another layer and how long before it complete cures? Hi Pamela! It does go bad after a few years or sooner if not sealed properly. A little yellowness is fine as long as you are okay with it. You can apply another layer as soon as it dries clear (6-8 hours) and it completely cures in 48 hours (or so, depending on the climate). Good luck! After you coat a tile in dimentional magic, can you grout it, Like for trays or a backsplash?? 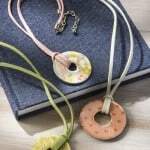 Can I use DM on a recycled gift card jewelry project? Will it stick to the gift card plastic? I may be using a pendant blank. Any suggestions? I have a question, I just did my first Mod Podge project on some photo’s. I liked them so much I thought I would decorate a bathroom with them. But them I wondered if the steam from the shower would ruin the whole project. Does anyone have any tips for this? Do you think the DM would help with that? Hi there! I would use a brush on outdoor sealer over the photos to make them bathroom steam proof. Mod Podge is strong, but if your bathroom gets pretty steamy, you’ll need that sealer. Can you mix glitter into the DM…I found a project sheet at HL and the pendent was made with Ice Resin and I would rather use something else because toxic fumes and pet birds don’t mix. Hi Tammy! Yes, you can sprinkle it in – and layer it. So you can sprinkle it, let it dry and repeat. Hi Shana – that is really odd and I’ve not heard of it cracking after the fact. I would e-mail Plaid here: http://plaidonline.com/contact-plaid.aspx They are very quick to respond! I got this product recently and I like it very much, but I have a question, i also use it as glue, so I put a tiny drop to glue a gemstone but it looks a bit opaque, maybe it got some of mod podge DM over the crystal, is there a way to clean that up? and does MPDM replaces resin? Hi Joanna – you can try to lightly scrape the crystal to see if you can remove it – I have done that before with success. As far as “replacing” resin, it’s not exactly the same because they are made of different things, but for the most part, yes you can replace resin with it. Thanks! Is it a problem getting jewelry wet that uses DM since it is water based? I’m nervous about it because I know you can soak it in warm water to start over. Also any tips on preventing air bubbles? Hi there! You can get it wet as long as it’s not submerged for too long – for instance, you could get caught in the rain and be fine (just dry it off). As far as air bubbles, I turn the bottle over and *LIGHTLY* tap the bottle against a table. Don’t ever shake it. Besides that, I pick the bubbles out with a pin or my finger. Good luck! I was concerned also about getting my DM projects wet and thinking they would fall apart. My first attempt at using it I had way too many air bubbles. I had to soak and redo. I have not had a problem since. What I do now is squeeze a little out first each time before applying to my project. So far, so good. I don’t want to talk too soon. lol. I also tell any potential customers not to shower or swim in their resin jewelry. 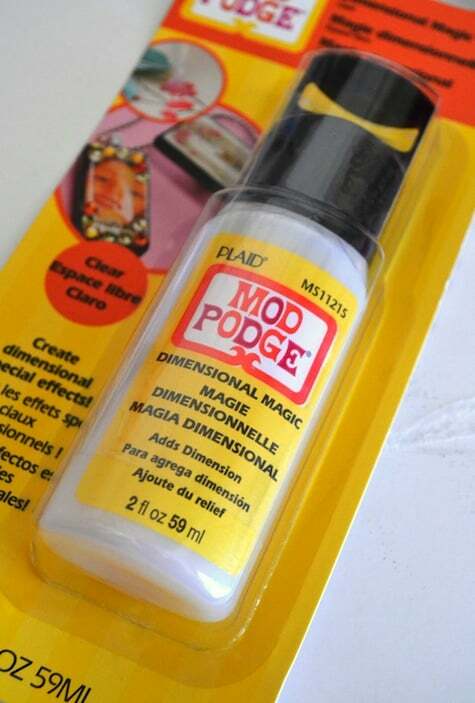 Can I use modge podge dimensional magic as an alternative for resin? I made a small bowl out of polymer clay and I want to fill it with dimensional magic. Will it dry cleat and solid? Hi Raquel! Yes you can – depending on how deep the bowl is, you’ll want to layer it so that it dries completely clear. Just do short layers and let them dry – they will all dry clear and solid on top of each other. Also don’t put it under a fan and let it dry in a warm area . . . otherwise it will crack. Thank you!